Neural Systems & Circuits welcomes pure theory papers, and we are happy to have all the math – no matter what the level of sophistication – in the main text. Here was a neuroscience journal that had vision and was not afraid of math. Over the following year, it also introduced some great ideas for article series such as ‘Invertebrate Circuitry’, and the ‘Opinionated Neuroscientist’. Best of all, the journal was open access, publishing all its articles under a Creative Commons CC-BY license. The field of neuroscience needed this journal. While fields such as physics have open access preprint servers like arXiv and are poised to open up even more research with the latest deal by the Sponsoring Consortium for Open Access Publishing in Particle Physics (SCOAP3), much of the research in neuroscience remains locked up in subscription journals where individuals or universities have to pay to read published articles. And more research is being locked up every day. Ask neuroscientists where they want to publish their next article and many will say Journal of Neuroscience, Neuron, or Nature Neuroscience – all subscription journals. Even those like Journal of Neuroscience, who offer what they call an “Open Choice” option, retain copyright to those articles and place restrictions on distribution and reuse. In other words, this publishing option does not constitute true open access, as defined by the Budapest Open Access Initiative. Neuroscience has a real access problem. Yes, there exist great open access neuroscience journals, including BMC Neuroscience, Frontiers in Neuroscience, and others. But there are relatively few players, and now there is one less. 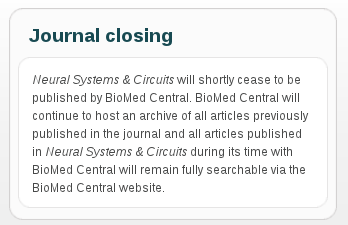 I contacted BioMed Central and the editorial team of Neural Systems & Circuits to inquire about the reasons for the journal’s closure and whether there are plans to publish the journal elsewhere, but have not yet received a response. (If and when I receive a response, I’ll post an update here. (Updated with response 10/16/2012: see below.) Perhaps naively, I also asked whether anything could be done to save the journal. If it is a matter of submissions, I’d be the first to start a grass-roots campaign. I’ll call every neuroscientist I know, if I have to, and ask them to grab that article that’s been waiting for a home and submit it. It’s not just about this one journal. I want to be proud of my field. I want to see that neuroscientists care more about the real impact of their science than the impact factor of the journal they publish in. I want to see that journals like Neural Systems & Circuits can be successful. Because if they can’t, with all the great ideas and policies they represent, then our field is truly in trouble. Thank you for your message and for outlining your concerns regarding the closure of Neural Systems & Circuits. I worked to establish the journal with the Editors-in-Chief, as we felt there was a clear need for a journal that bridged both computational and experimental neuroscience, and that an open access journal would provide the perfect platform for such integration. Along these lines, we encouraged pure theory papers and the inclusion of all math in the body of the paper, with the aim of setting out clear and precise ways for scientists to utilize computational studies. From the outset, the journal struggled to attract submissions. We tried our hardest to find innovative ways to make the journal attractive to the neuroscience community, such as the “Opinionated Neuroscientists” and “Invertebrate Circuitry” series, and through the commissioning of review articles in interesting areas. Unfortunately, this didn’t result in a sustainable level of submissions, and we took the difficult decision to close the journal earlier this year. I’m sure you will appreciate that this decision was not taken lightly, and that we would have been delighted to keep the journal, had there been the prospect of viability, and support from the community. I am heartened to hear your views on the field and thought you may like to know about some other open access neuroscience journals within our portfolio, such as BMC Neuroscience, Neural Development, Behavioral and Brain Functions and Molecular Brain. So, the reason for the journal’s closure was indeed a shortage of submissions. Although her email does not say so explicitly, it seems there are no plans to publish the journal elsewhere. The problem, as she puts it, is the need for “support from the community”. Although I am sure some will say I am overstating the importance of the closure of this one journal, I think it does not speak well for the field of neuroscience that this support was lacking. I certainly hope that if BMC, or other publishers, decide to launch journals like Neural Systems & Circuits in the future that the outcome is different. In the meantime, I encourage those of you in the field to consider submitting your next manuscript to one of the journals Anna suggested in her email, or other open access neuroscience journals like those in the Frontiers collection. It is important that these journals receive our support so something like this doesn’t happen again.